There are 20 reviews of Soir de Lune. It seems reversed. The opening is, surprisingly, all about honey. Then comes the peach, and follows a sweet rose that stays and stays and stays until it becomes powdery. A gift from my daughter ( who knows me so well)! Its lovely, wearable. Clean...... review from Darvant made me smile because I'm British and yes, it does evoke clean, and laundry, but for some of us there is something powerfully aphrodisiac about that! Whenever I go shopping for perfumes, I bring home the little pieces of paper on which the fragrances are sprayed. I use them as bookmarks. 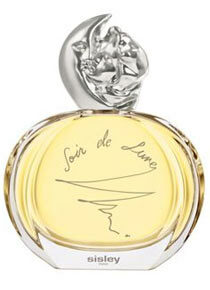 One day I came home with Soir de Lune, and my cats fell in love with it. I showed them the other scents I brought, but they behaved with this one as if catnip was its main note. I bought it, of course. When your cats are so eager to tell you something, you better listen -- even if they prove to have such expensive tastes. I love it, and I think it is a very elegant, sophisticate fragrance. Any celebrity walking the red carpet would be fine in it. However, as I live on a more modest scale, and in a tropical city to boot, I have the feeling, now and then, that we were not made for each other. That's when I spray my 4711 on, step out into the sunshine and wonder what life in a cold climate would be like. Lordy this is phenomenal. Upon first sprtiz, it is HEAVILY Rosy and is almost indistinguishable from Narciso Rodriguez, Agent Provocateur and other rose based offerings. But give it 15 minutes and it transports you to perfume heaven. There is heavy sweet peach, spice, oakmoss in abundance and honey and nutmeg too. After a time, none of the individual notes stand out but instead form a WARM, luxurious, feminine fragrance that is both sexual and classical at the same time. Sillage is perfect in the category of never lost but never overpowering either and lasting power is tremendous. I have Eau de Soir as well and have tried a sample of the body lotion which I usually avoid as they are seldom true to the fragrance but in Eau de Soir I think the lotion may be even better. I am therefore dying to try this beauty in lotion as well. This is what perfume used to be and seldom is anymore. Hope they never change it. Do try if you are an admirer of mature, intoxicating chypres, you'll be glad you did! This is in my opinion a less floral and darker version of the renowned Eau du Soir Sisley, i mean a more shadowy one due to a developed presence of sandalwood, spices, moss and patchouli. This one is a classic green-floral-honeyed chypre, more stressed on the side of oakmoss than on the one of woods, a scent with an obscure, almost salty (and anyway deeply opaque), floral-laundry wake over shadowed by muguet, patchouli and jasmine. Here the flowers are darker. A more present rose is starring and sinister and, in its chord with mimosa, bergamot, iris, musk-moss and honey, develops a deeply soapy, fruity (peaches) and laundry effect that is overly shadowed by jasmine, pepper, patchouli and muguet and pushed up in attractiveness by the insertion of animal civet on the flank of honey, luxurious peach and amber. The duo iris-jasmine imprints sophistication to the general laundry atmosphere but is not enough to balance the modern charm with a may be too stressed traditional, british style, soapy-detergent laundry feel which stereotype this fragrance is a lot anchored to. The final issue is a classy, for sure, but may be too neutral, old school, soapy concoction, heavy in moss, rose, honey and mimosa while Eau du Soir is a bit more bright, luxurious and sophisticated. Luca Turin called this a "cheap, nasty knock off of Parfum de Peau" and gives it one star. While I have yet to get a sample of PdP, I can tell you there is nothing cheap or nasty about this (and at 240$ a bottle, you go in expecting good quality). This is the first perfume I ever fell in love with and I love every facet of it as it evolves on my skin. It is a transformer that quickly morphs into a big complex rose tempered with honey and spice. And then it becomes an exquisite musky-moss still tinged, but with a different rose. It is complex and deep, with extraordinary sillage that lasts a blissful 6 hours or more on me. There is not one disagreeable note in it, to my nose. It is harmonic euphoria in a bottle. I do see, however, that there are some people who have a strong negative reaction to it, so I think it might be one of those perfumes like Angel, that you either understand immediately and love or that you hate. But it is far less radical than Angel. If you do not like rose, than this is not the one for you. But it is the one for me and I am grateful I found it. It is, by the way, a true chypre with the oakmoss intact. It is mature, sophisticated and classic. There are no member images of Soir de Lune yet. Why not be the first?